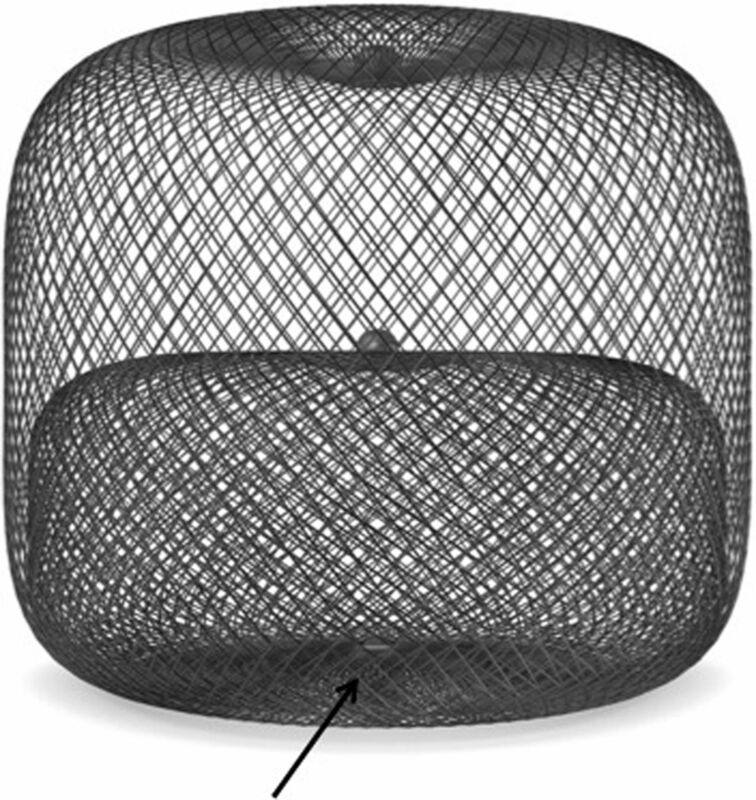 Objective The WEB (WEB aneurysm embolization system, Sequent Medical, Aliso Viejo, California, USA) is a self-expanding, nitinol, mesh device designed to achieve aneurysm occlusion after endosaccular deployment. The WEB Occlusion Scale (WOS) is a standardized angiographic assessment scale for reporting aneurysm occlusion achieved with intrasaccular mesh implants. This study was performed to assess the interobserver variability of the WOS. Methods Seven experienced neurovascular specialists were trained to apply the WOS. These physicians independently reviewed angiographic image sets from 30 patients treated with the WEB under blinded conditions. No additional clinical information was provided. Raters graded each image according to the WOS (complete occlusion, residual neck or residual aneurysm). Final statistics were calculated using the dichotomous outcomes of complete occlusion or incomplete occlusion. The interobserver agreement was measured by the generalized κ statistic. Results In this series of 30 test case aneurysms, observers rated 12–17 as completely occluded, 3–9 as nearly completely occluded, and 9–11 as demonstrating residual aneurysm filling. Agreement was perfect across all seven observers for the presence or absence of complete occlusion in 22 of 30 cases. Overall, interobserver agreement was substantial (κ statistic 0.779 with a 95% CI of 0.700 to 0.857). Conclusions The WOS allows a consistent means of reporting angiographic occlusion for aneurysms treated with the WEB device. 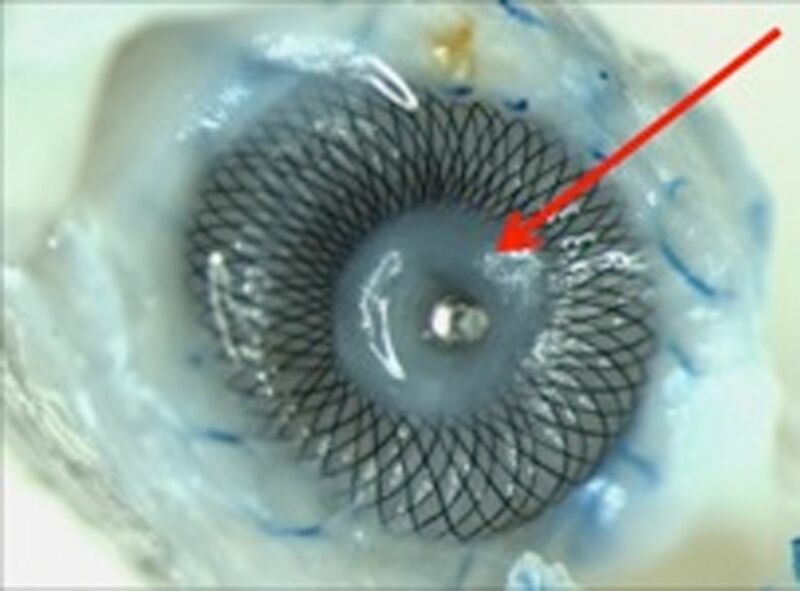 The WEB (Sequent Medical, Aliso Viejo, California, USA) is a self-expanding, oblate, braided nitinol mesh device which is designed to achieve endosaccular occlusion of wide-necked, bifurcation, cerebral aneurysms (figure 1). The braided surface of the WEB, when deployed within the aneurysm, forms a dense mesh surface at the interface between the parent artery and the aneurysm. This mesh presents a barrier to inflow of blood leading to aneurysm thrombosis, followed by neoendothelial–neointimal coverage of the WEB at the parent artery–aneurysm junction (figure 2). Once achieved, this theoretically leads to a durable, complete occlusion of the aneurysm. The proximal and distal surfaces of the WEB are demarcated by radio-opaque marker bands which are slightly recessed into the body of the device—thus forming a concave ‘marker recess’ at the parent artery–aneurysm interface (figure 1). The double layer WEB is a self-expanding, oblate, braided nitinol mesh device. The proximal and distal surfaces of the WEB are demarcated by radio-opaque marker bands which are slightly recessed into the body of the device. The concave proximal surface of the device forms a ‘marker recess’ at the parent artery–aneurysm interface. 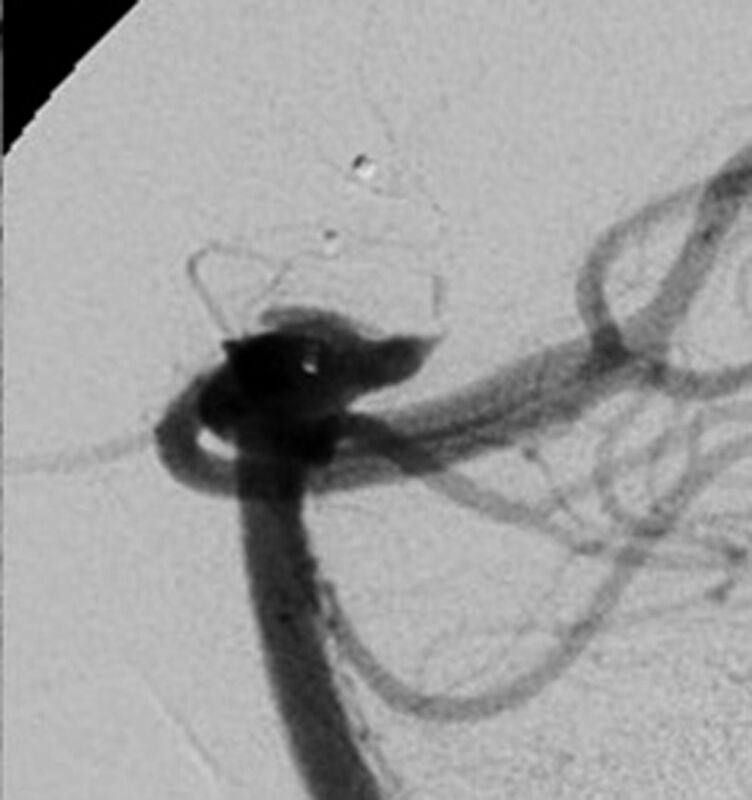 Ostial view of an explanted canine bifurcation aneurysm treated with the WEB. After 6 months, very dense fibrous tissue fills the region of the central marker recess (arrow). This new approach to aneurysm treatment creates an angiographic appearance that differs slightly from one created after treatment with coils or flow diverters. Specifically, the central ‘marker recess’ must be differentiated from residual filling of the aneurysm neck. The WEB Occlusion Scale (WOS), based upon the modified Raymond Scale, is an angiographic assessment scale for the standardized reporting of aneurysm occlusion achieved with intrasaccular mesh implants (figure 3).1 ,2 This study was performed to assess the interobserver variability of the WOS—particularly with respect to the ability to differentiate aneurysms that are completely occluded or have a ‘marker recess’ from those with residual neck or residual aneurysm filling. Web Occlusion Scale. 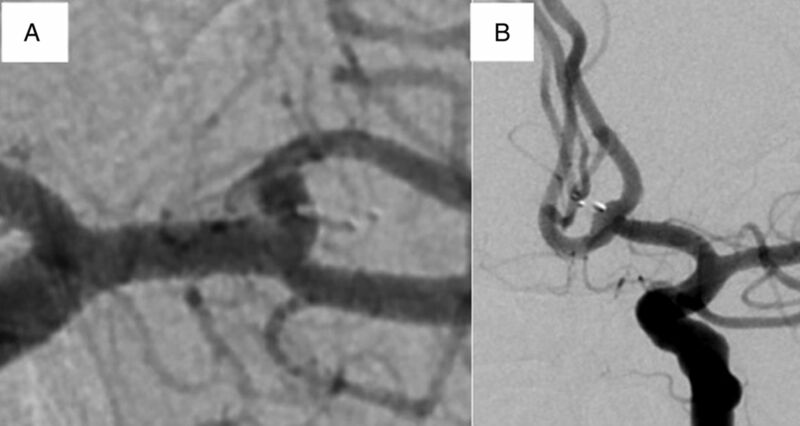 Grade A and B indicate complete occlusion, with (A) or without (B) an angiographically visible collection of contrast within the marker recess. Residual neck filling (C) is indicated by contrast opacification of the aneurysm neck extending beyond the expected bounds of the marker recess. Residual aneurysm filling (D) is indicated by contrast opacification extending beyond the aneurysm neck and into the fundus, either deep to the proximal marker recess or around the periphery of the device. Before the study, seven senior neurovascular expert reviewers (endovascular neurosurgeons and interventional neuroradiologists) were trained to interpret aneurysm occlusion using the WOS developed by Lubicz et al2 (figure 2). For this training, the ‘marker recess’ was defined as a well-circumscribed collection of contrast, the upper border of which corresponds to the concavity at the base of the WEB. Reviewers were trained to recognize the characteristic morphology of the recess, lying at the junction between the WEB and the parent artery and demarcated by the radio-opaque proximal marker band positioned approximately in the center of the ‘marker recess space’. Filling of the marker recess space was to be considered ‘extra-aneurysmal’ and thus not indicative of residual aneurysm filling or incomplete occlusion. The anatomical location of the 30 aneurysm test cases were middle cerebral trifurcation/bifurcation (n=11), anterior communicating artery (6), and basilar apex (13). In the series of aneurysms the reviewers rated between 12 and 17 aneurysms as completely occluded, between 3 and 9 as nearly completely occluded and between 9 and 11 as showing residual aneurysm filling (table 1). Agreement was perfect across all seven observers with respect to the presence or absence of complete occlusion in 22 of 30 cases. Six of seven observers agreed upon complete occlusion in 25 of 30 cases (figures 4⇓–6). (A) Complete occlusion of a middle cerebral artery (MCA) aneurysm, without evidence of ‘marker recess’. The marker recess in this case is probably oriented in such a position that it conforms to the natural course/curvature of the upper division MCA branch, providing a complete reconstruction of the MCA bifurcation. There is no filling of the aneurysm neck or fundus. (B) Complete anterior communicating artery aneurysm occlusion with marker recess (grade B). The aneurysm neck and fundus are completely occluded. A small, ‘bell-curve’ shaped collection of contrast comes to an apex at the proximal radiopaque marker. No contrast extends laterally to the bell-shaped collection into the aneurysm neck, or deep to the proximal radio-opaque marker, into the aneurysm fundus. This would be graded as a grade B, complete occlusion. Residual filling of the neck of a basilar artery apex aneurysm treated with the WEB. Contrast extends lateral to the expected ‘bell-shaped’ marker recess, penetrating into the proximal aspect of the aneurysm neck (grade C). Residual filling of the fundus of a basilar artery apex aneurysm treated with the WEB. Contrast extends about the posterior aspect of the WEB device and penetrates into the fundus of the aneurysm, beyond the region of the aneurysm neck (grade D). Overall, interobserver agreement (κ) for the dichotomous endpoint was considered to demonstrate substantial agreement (κ=0.78 with a 95% CI of 0.700 to 0.857, p<0.0001). When a three-category scale was used (complete/marker recess, neck remnant, and residual aneurysm) the κ was 0.70 (95% CIs 0.64 to 0.75, p<0.0001), indicative of ‘good agreement’. This dataset demonstrates that a group of independent reviewers can discern complete occlusion from angiographic images of aneurysms treated with the WEB device with substantial interobserver agreement. Of practical significance, interpreters could consistently discern filling of the concave ‘marker recess’ from residual aneurysm neck filling. This observation provides a foundation for the application of the WOS as an angiographic endpoint in future studies of intrasaccular flow diverters. Endosaccular flow diverters are a new category of cerebral aneurysm occlusive devices. 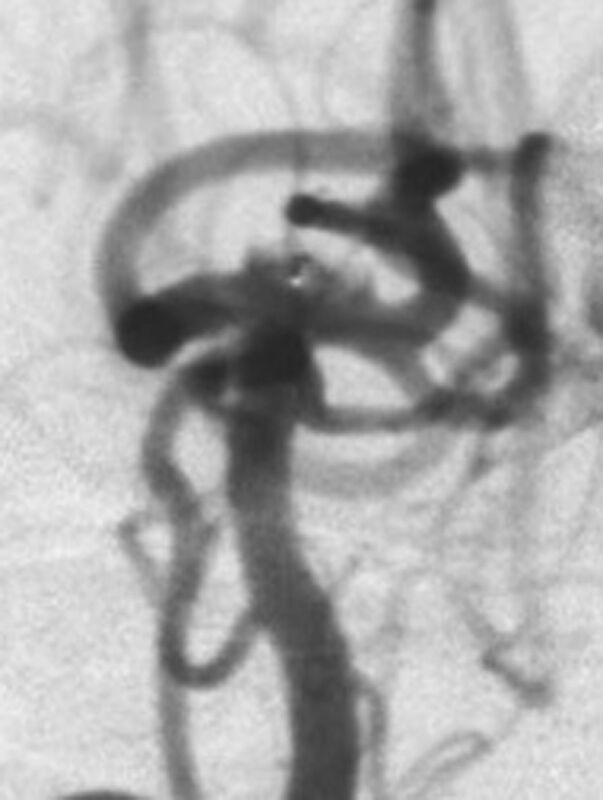 The angiographic appearance of aneurysms treated with these types of device differs from that of aneurysms treated with traditional endosaccular coils or endoluminal flow diverters. The modified Raymond scale provides a standardized lexicon and assessment mechanism by which to evaluate aneurysms treated with coils.1 Similarly the O'Kelly-Marotta (OKM) grading scale provides a standardized means of evaluating aneurysms treated with flow diverters.5 These types of standardized metrics are critical for the assessment of devices in clinical trials. This contention has also been supported by the available clinical data. Recently, Lubicz et al,2 reported the initial clinical durability of the WOS in a core laboratory-adjudicated, retrospective, multicenter cohort of 28 WEB-treated wide-neck bifurcation aneurysms where short-term outcomes (5.0 ± 2.3 months) were compared with mid-term outcomes (14.3 ± 7.0 months). In that small study, 19/19 (100%) cases scored as completely occluded (figure 2; grade A or B) at the short-term follow-up maintained complete occlusion at the mid-term examination. 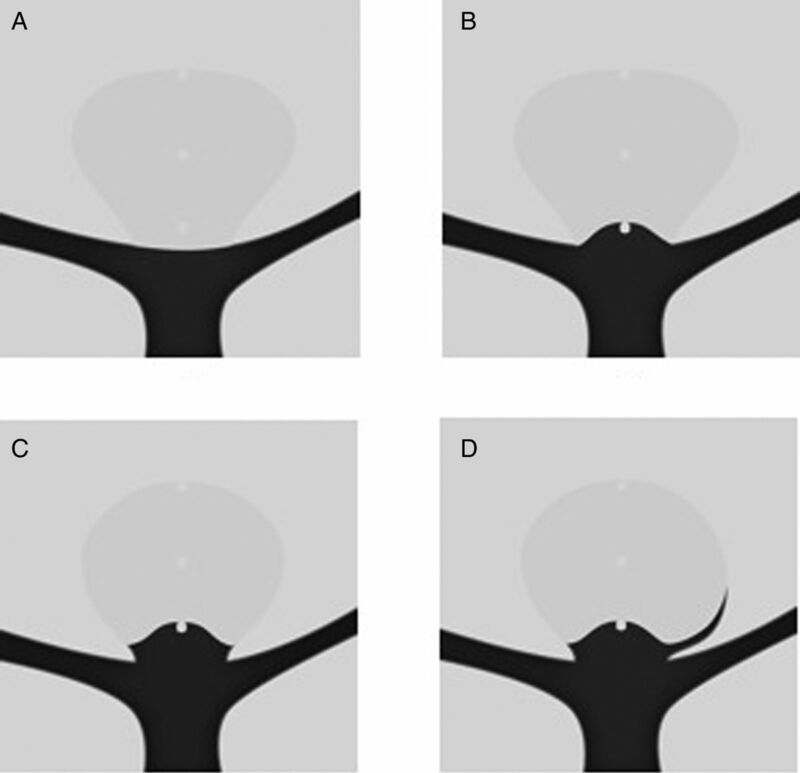 On standard two-dimensional angiography the ‘marker recess’ is identified as a characteristic ‘bell-curve shaped’ collection of contrast, the upper border of which corresponds to the concavity at the base of the WEB. Moreover, the radio-opaque proximal marker band should be positioned approximately in the center of the marker recess space (figure 3). Any contrast opacification extending laterally to this recess should be considered indicative of residual aneurysm neck filling (figure 4). Any contrast penetrating deep into this ‘marker recess’, either centrally or peripherally, should be considered indicative of residual filling into the aneurysm fundus (figure 5). The substantial level of agreement achieved in this study using the WOS (κ=0.78) is similar to that of the OKM scale (0.74) for parent artery flow diverters.5 In addition, Suh et al,6 reported a comparable level of interobserver agreement (κ=0.76) for determining complete occlusion after flow diversion with Pipeline. Cloft et al,7 described a varying level of interobserver agreement which was contingent on the number of choices provided, with a similar level of agreement (κ=0.71–0.72) on a three-response scale and slightly greater agreement (κ=0.94–0.96) on a two-response scale. However, the dichotomous response scale used in this study was structured to differentiate complete or near complete occlusion from partial occlusion, which is probably a more straightforward determination than complete occlusion or not. The WOS demonstrated a substantial level of interobserver agreement for the determination of complete or incomplete occlusion after WEB treatment. The level of agreement in assessing complete occlusion was similar to that seen for other commonly used aneurysm grading scales. The interobserver variability is sufficiently reproducible for it to be used as a primary angiographic endpoint in future clinical studies. The predictive value of the WOS after treatment and during follow-up can then be defined within the context of these clinical studies.
. Statistical methods for rates and proportions. New York, NY: John Wiley and Sons, Inc, 2003.
. A novel grading scale for the angiographic assessment of intracranial aneurysms treated using flow diverting stents. Intervent Neuroradiol 2010;16:133–7.
. Observer agreement in the assessment of endovascular aneurysm therapy and aneurysm recurrence. AJNR Am J Neuroradiol 2007;28:497–500. Contributors All authors made substantial contributions to conception and design, acquisition of data, or analysis and interpretation of data. Competing interests DF and AA are consultants for Sequent Medical and receive institution salary support. LP and AM are consultants for Sequent Medical. JB provides core laboratory services for the WEBCAST European Study. GD and CS are consultants for, and hold financial interests in, Sequent Medical. TM is an employe of, and holds financial interests in, Sequent Medical. Data sharing statement All relevant data are included in this publication.